Through the lens I see fog, sunny days and twilight nights of August. Your posted comments are a delight to us. Thanks. HOUSE HOLD HINT: Festive ice cubes ~ use herbal flower (violets, alendula, mint flowers or nasturtiums) into each section of ice cube tray, fill with water and freeze. 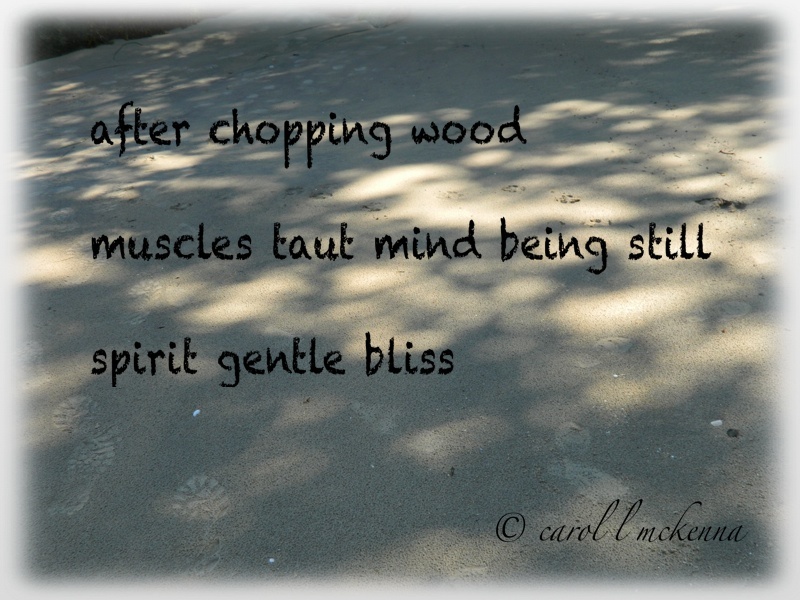 beautiful pictures i loved your chopping woods haiku!! The aching muscles after chopping wood.. that's a good ache.. Your posts are such a delight! I love your words and images! "Serenity" is just so powerful and the bird and balloons, I love them so! Lovely images, Carol! I enjoy your water scenes and the haiku! Cute shot of the Gull! Enjoy your week! Lovely photos and words......first one is brilliant! I would say the mind is just plain numb after chopping all that wood! I really like your baloon photo. Clean and beautiful colors! Beautiful shots and words. I love the multicolored umbrellas. Love that quote to ponder by Gandhi! The couple in the colorful chairs amkes a wonderful photo--it would be a fun greeting card! What a great series of shots, very summery and fun. Beautiful and serene! I especially like "Serenity"! Great photo of those balloons. Love the red balloons! And cool close-up of the lone gull. Love those balloons, and the folks sittting serenely in the sun and taking in the view. 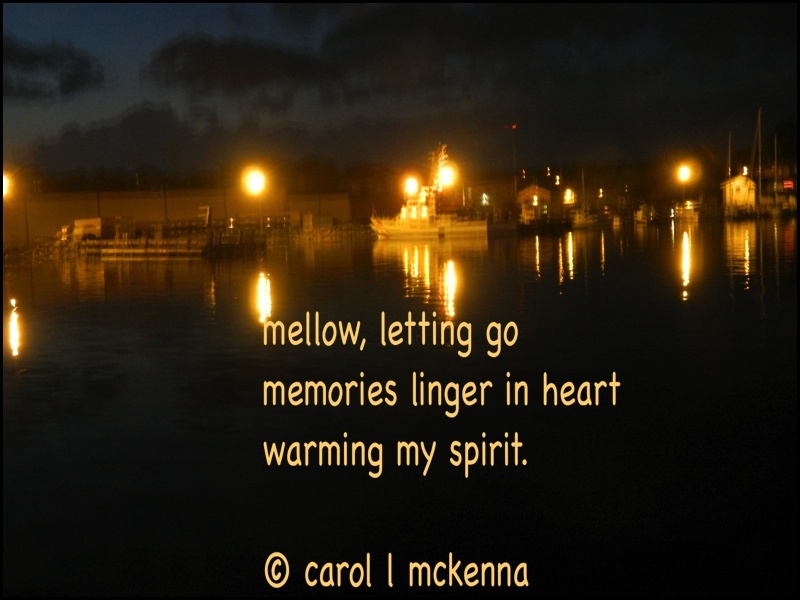 Wonderfully written haiku Carol and your photos are really beautiful. By the way I understand that you have some trouble with prompts at Carpe Diem Haiku Kai on blogspot and the Carpe Diem "Tackle It Tuesday" weekly meme? "Tackle It Tuesday" is on Wordpress, it's a new weblog which I started it's called "Carpe Diem's Tackle It Tuesday" and it's a weekly prompt on Tuesday. Lovely pictures! And how clear the water is! That's a great shot of the bird. I love the picture of the chairs by the water. Now that's the makings for a good day! Beautiful and peaceful images and sentiments! I love the red balloons in the sky. It's the simple things in life that mean so much. Your summer photographs are fantastic! I can hear the seagulls and the wind and the lapping of the waves. It's wonderful how many feelings you can wake up with your pictures! I think after working with my saw, I end up five pounds lighter having shed gallons of perspiration. These photos capture your beautiful, peaceful, serene spirit, Carol and the sweet gentle spirit of Artmuse dog. Ah, yes soothing oceans. Once in Maui many years ago - in the morning I was able to walk in the clear warm ocean up to my neck! Not all waters are clear, warm or soothing. Love the seagull, but those red balloons put 99 balloons by Nina in my mind. That harbor at twilight seems so calming!! I do love the harbor shot at twilight, too! Such a calm, beautiful sight!! Great capture! Thanks for sharing, Carol!! 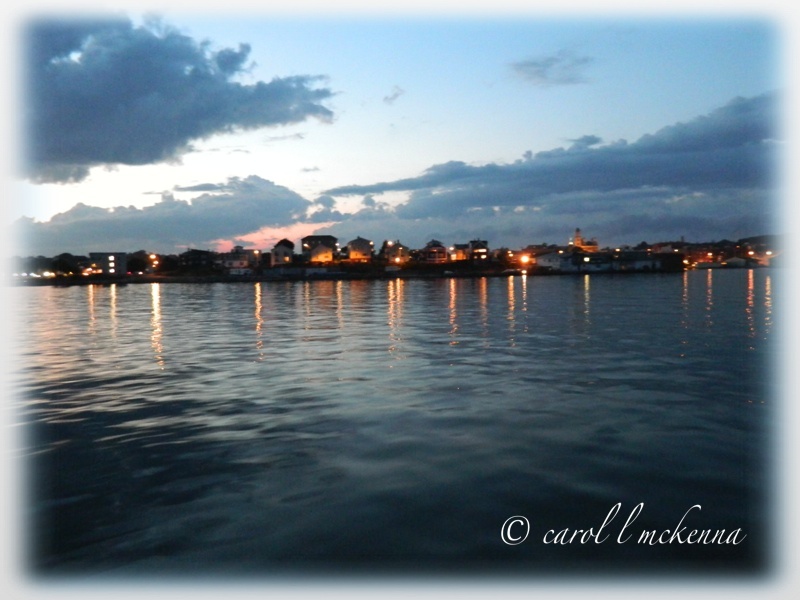 Beautiful photos of the harbor and the sky, Carol! Beautiful harbor. I love twilight. Thanks for sharing these. Beautiful harbor summer days. Had to smile at the contrasting haikus today. Chopping wood vs total relaxation! I choose the latter ( but you'll be happy for that woodpile in a few months! Ah... Very nice photos and lovely places. Ah! The living is good! I always enjoy your beautiful photos. You live in such a scenic place. These a beautiful, Carol! The balloon shot is a favorite. Beautiful pictures ! I love seagulls ! Lovely captures of the seaside. Like the Quote too. 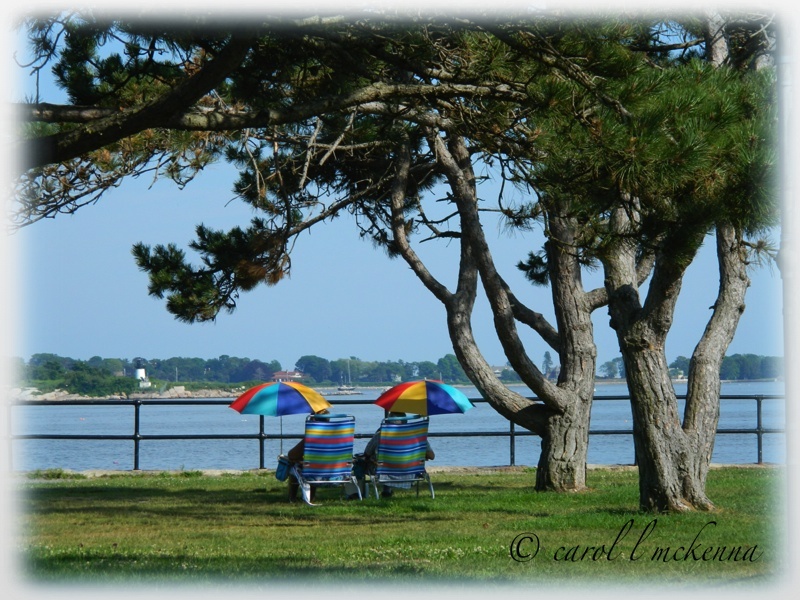 I soooo appreciate your coastal photos, Carol! AND you are just magical with your haiku! so much beauty in your post today. i lived in the gentle harbor of mendocino for nine blissful years. coming to your blog home always ignites my ocean love. thank you for your comforting and caring comment this morning at recuerda mi corazon. i feel your love and am so grateful for friends like you. 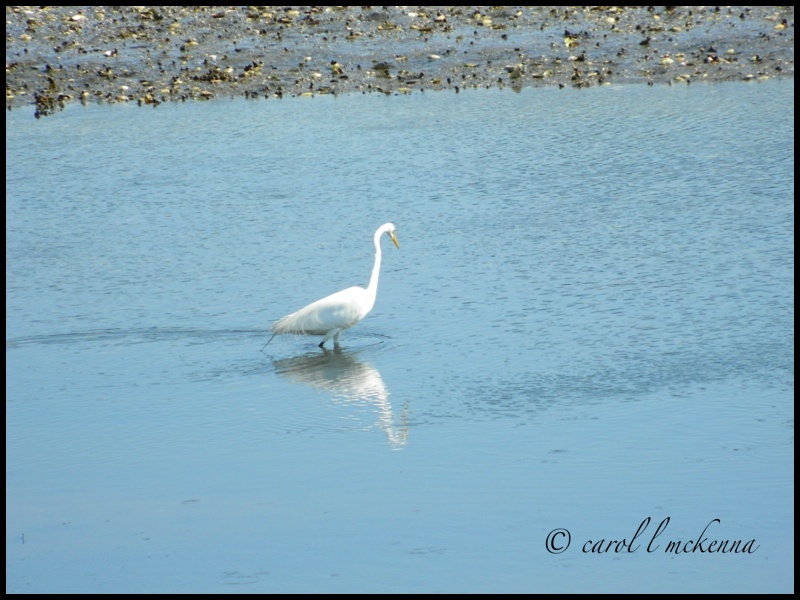 Wonderful photos and haikus, Carol! I like the memories warming your spirit. Lovely. Love the carefree, relaxed spirit in all of these. How like Autumn to reflect back the summer but easy us into our annual earthly sleep. Love the top photo, as well as the one with the colorful chairs. Oh it's a spectacular B&W! I'd like to be sitting under one of those rainbow umbrellas right now, listening to the cry of the gulls, watching the boats go by! Beautiful series. Love your Black & White Weekend photo. what lovely reflection from your first set of photos. I used to join the Saturday Reflection meme. 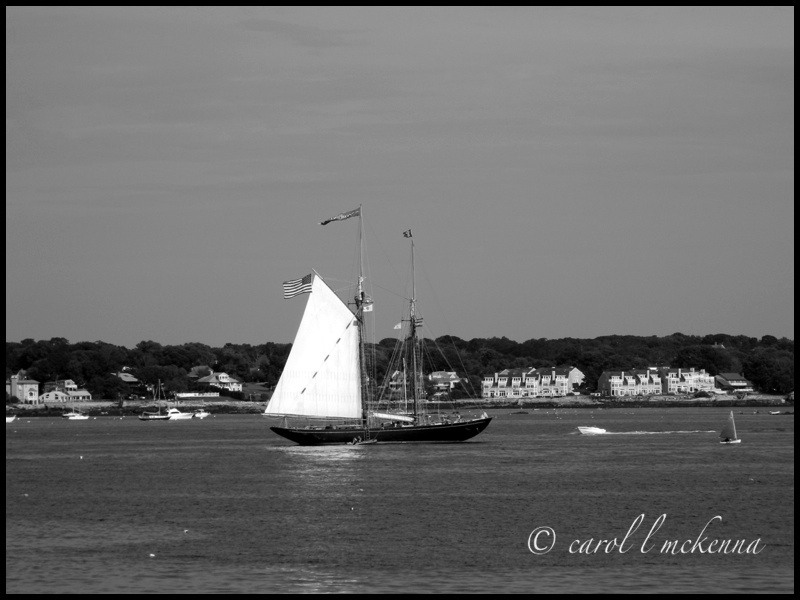 Lovely photo of the schooner. 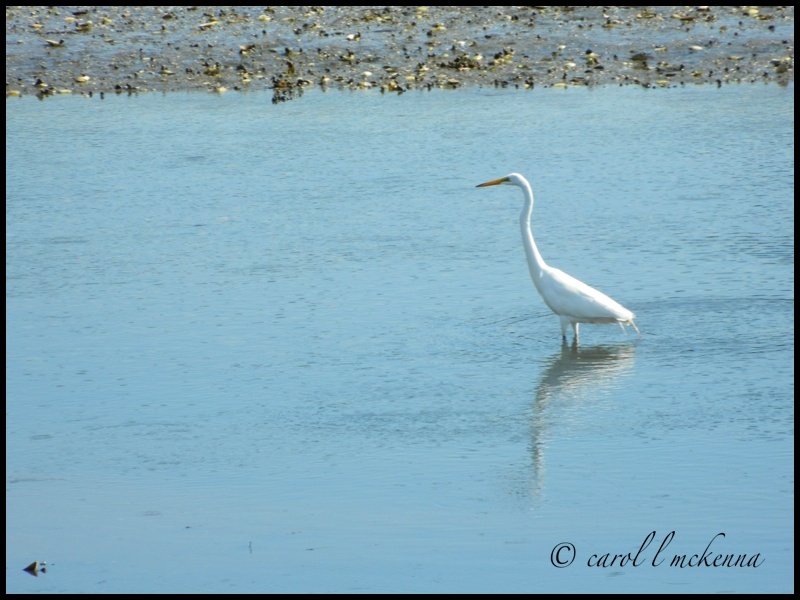 Pretty shots of the egret fishing.. 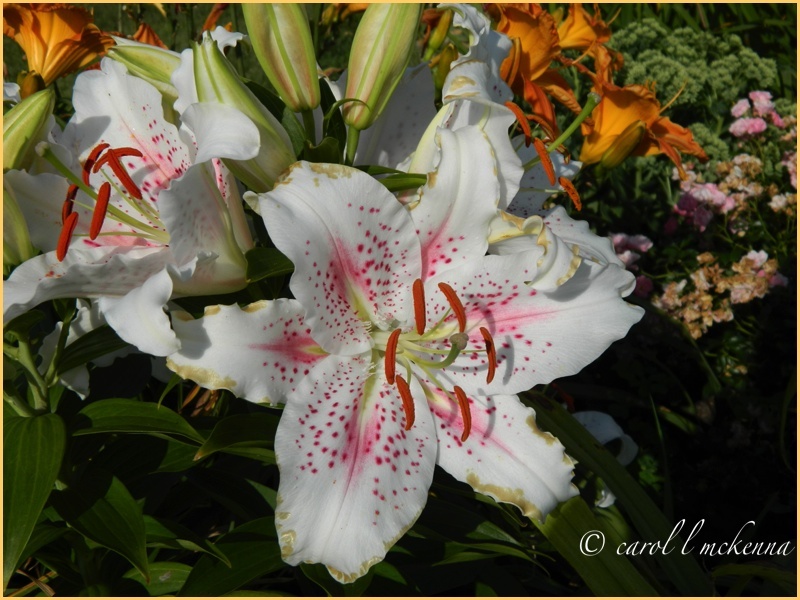 Wonderful collection of images, Carol! Thanks for sharing your post with my critter party.. Enjoy your weekend! Such a beautiful collection Carol! At first I thought I had found a favorite, but as I kept scrolling I kept finding more. Lovely scenes! Love the and the Gull shots. Have a great weekend. Lovely images, Carol... 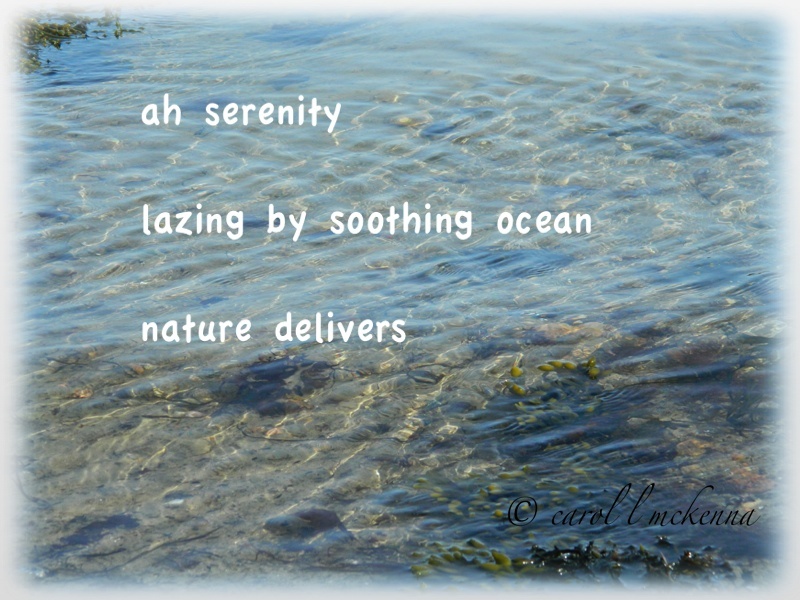 I enjoy all water scenes and the haiku... Excellent shots..
Carol, they are all lovely shots. I adore the gull (I think they are so much fun to watch). you could show me "water pix" all day and I'd not get tired of seeing them. happy critter day! Imagens lindas, gostei mais do lírio... maravilhoso!!!! Beautiful! I love the elegant egret and the gorgeous lilies. Have a wonderful weekend, Carol! I have memories that warm my spirit too. I know what you mean. A wonderful set carol!! The egret images were my favorites, but I also really liked the beach chairs with the colorful umbrellas!! I'm visiting from Saturday Critters! I always enjoy watching egrets - the are such elegant birds to study and photograph. I like the Great White Egret. Love your twilight shot Carol.....fabulous! There is a certain warmth in letting go, isn't there? My favorite is the lone gull. But they're all mesmerizing. Beautiful photos, haikus, and sentiments. Lovely! Lovely shots. I like that lone gull looking out to sea. Gull was actually looking into my window and not looking out to sea ~ amazing ~ huh? I love twilight, it is for me a time of mellow reflection, love your haikus. I don't chop wood, but I dig with a mattock, so I know that feeling of gentle bliss after all the muscular activity. Hi,Carol. This post is filled with splendid photographs and wonderful and heartwarming 3 kind of haiku. I enjoyed your post very much. Thanks for sharing. Wonderful shots, the twilight picture is enchanting. great collection of shots and poetry. All pretty shots. Especially the egret and reflections. Wonderful series. Your world is so beautiful! Love the egret and the schooner. I like all your photos, even though I come here from Alphabe-Thursday! 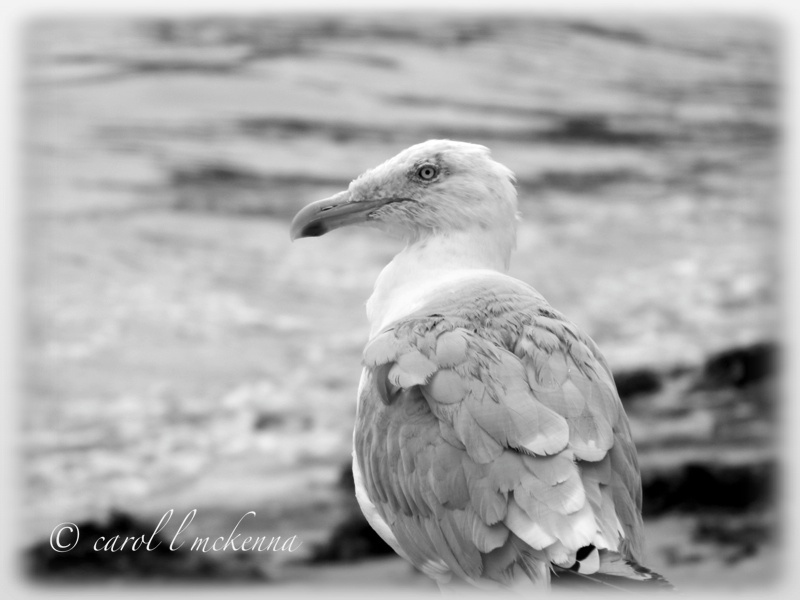 The lone gull photo is lovely! There's something fun about the balloons soaring in the sky. Chairs in front of a body of water will always grab my attention. agreed! nothing like the ocean! Thanks for letting us have a peek at the lonely gull! 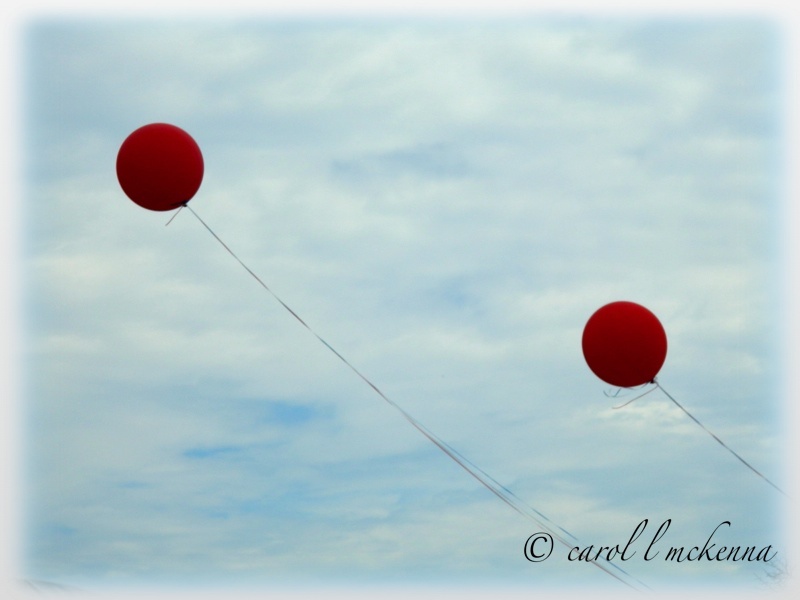 I loved the photo of the red balloons, too! Thank you for linking for the letter L.
So peaceful there. Egrets are so regal looking.